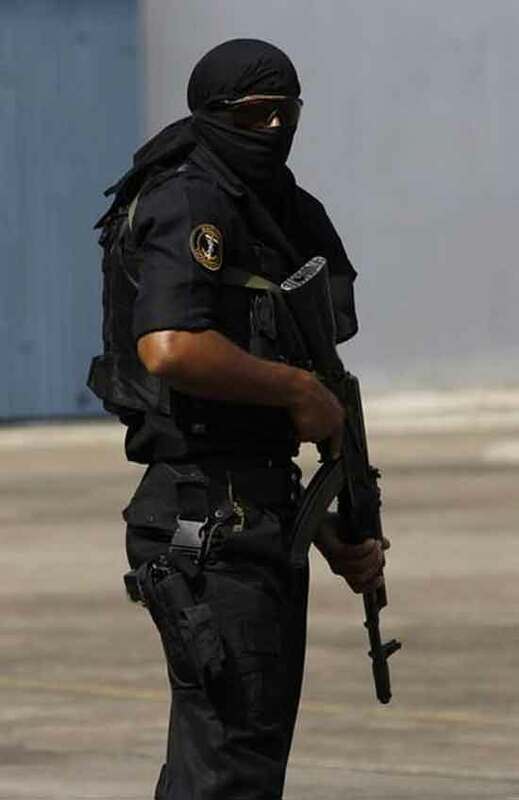 The need for Marine Commando (MARCOS) was first accepted in 1985 for the defence of offshore assets in Bombay High against clandestine attacks. The commandos’ task was to evict terrorists who had already taken over an oil production platform. 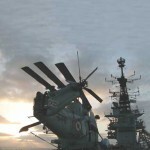 Sanction was accorded for the raising of an “Indian Marine Special Force (IMSF)” and for commando version helicopters to fly them swiftly from Bombay to Bombay High. Within two years their initial role widened. In end July 1987, the commandos accompanied the Indian Peacekeeping Force (IPKF) to Sri Lanka to deal with the secessionist LTTE’s marine elements that were operating in the shallow lagoons around Jaffna. Marine Commandos are highly trained, elite ‘Special Naval Forces’ and can be recognised by their maroon berets and the commando badge over their name tally. 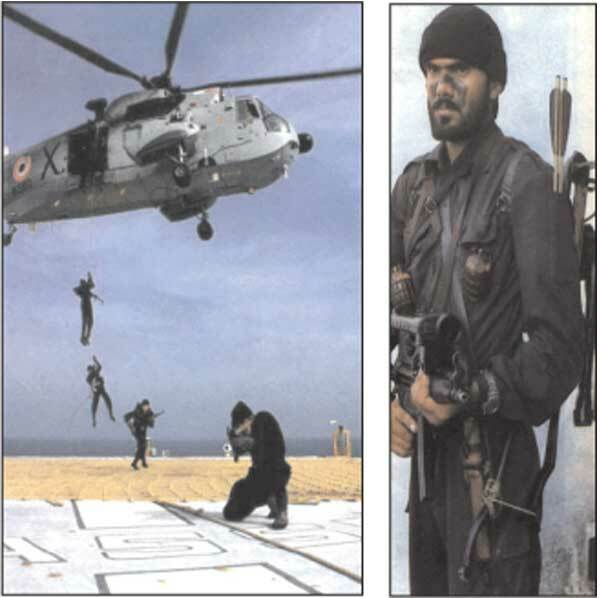 In 1989, the IMSF was renamed as the Marine Commando Force (MCF) and INS Abhimanyu became the parent (HQ) naval establishment for Chariot and Marine Commando operations. Abhimanyu is under the operational control of Flag Officer Maharashtra Area, who is responsible for the defence of Bombay. In 1992, MARCOS East was formed and based at Vizag. In order to infuse young blood, a voluntary category of commandos was introduced in 1995, termed as MARCO (General Duties) in addition to the existing MARCO (Advance) category who serve for 3 to 5 years. The initial sanction for the IMSF was 38 officers and 373 sailors. In 1999, after seeing the effectiveness of the MCF in Operation Vijay during the Kargil war, sanction was accorded for an additional company of 29 officers and 246 sailors. 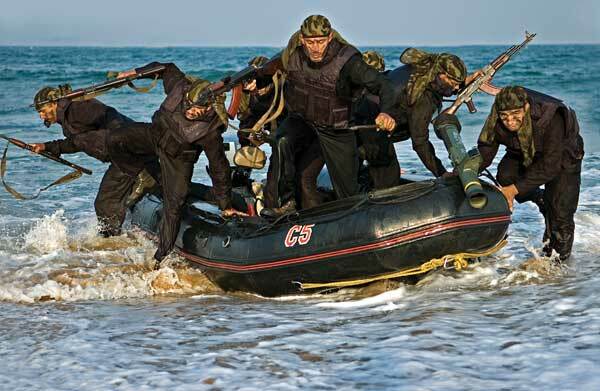 The MCF is organised as MARCOS East based at Vizag and MARCOS West based at Mumbai to cater for special operations on the Eastern and Western seaboards. In addition, one small MARCO unit has been based at Port Blair to meet the Special Ops requirements in the Andaman and Nicobar Command. To develop combat efficiency, the Special Forces of various Navies were studied. The Prahar concept was introduced in 1992. A Prahar consists of 8 commandos. After qualifying as MARCOS, officers and sailors remain in the MARCO sub-cadre for 3 and 5 years respectively. To conduct clandestine, surveillance & reconnaissance missions/operations and combat maritime terrorism. To support amphibious operations and special force missions. MARCOS undergo 10 weeks basic training in INS Abhimanyu followed by a three week Basic Para course at the Army’s Para Training School at Agra. They also undergo a basic Combat Divers course. Basic training includes handling of arms, ammunition and explosives, unarmed combat, close quarter battle, jungle warfare tactics, para-jumping, kayaking, photography, ship intervention drills, hostage rescue, and recapture of offshore installations, SAS/SBS and chariot operations. The language and culture of likely adversary areas, to enable them to operate and survive behind enemy lines. Sniper competence and training on shoulder-launched missiles, MMGs, etc. Sky diving with water-para jump capability. Making Improvised Explosive Devices (IEDs) with readily available items. For special operations on land, MARCOS are required to be deployable from the sea and from the air. In the advanced phase MARCOS are trained in beach, coastal, riverine and jungle warfare. Candidates for advance training must have qualified in static line and freefall. The MCF is one of a handful of units in the world that is capable of para-dropping into the sea with full combat load and equipment. To keep themselves combat ready, MARCOS participate in joint exercises and training with foreign and Indian Army Special Forces. 1991 Operation Tasha. Two Prahars were deployed off the southern Tamil Nadu coast to interdict LTTE infiltration and the smuggling of arms and ammunition. 1992 Operation Zabardust. MV Ahat, an LTTE vessel smuggling arms and ammunition was intercepted off Madras by MCF personnel. They boarded the vessel and captured all the mercenaries before LTTE sank the vessel. 1993 United Nations Operation in Somalia. Four teams of MARCOS were deployed off Mogadishu in support of the Indian contingent in Somalia. The team provided Maritime Special Ops support to the Naval Task Force. 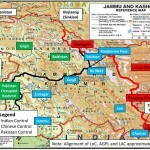 1995 Operation Rakshak. Two to four teams of MARCOS are deployed round the year in Jammu & Kashmir, at Wular Lake. This 250 square km lake, surrounded by mountains, was being used freely by militants to reach Srinagar, saving them from having to travel 100 kms through the mountains. In 1995, a team of MARCOS was positioned at the lake and within weeks, militant activity on the lake ceased. In subsequent years, in addition to meeting the requirement of deterring militants from using the Wular Lake, MARCOS started operating on land and Prahars killed several militants and recovered a large quantity of arms and equipment. 1999 Kargil War. MARCOS assisted army operations during the Kargil war. how to join the marcos and what qualifications required ? i am studying (GME) Graduate Marine Engineering. I want to joint navy seal. Just 1 question, are the marcos sailors or officers? If you read the article carefully, you’ll realize it’s a combination of officers and sailors, with the ratio being somewhere around 3:1 respectively. Good luck! MARCOS is a voluntary cadre/ branch of the Indian Navy for which you apply once you’re part of the Indian Navy either as an officer or a sailor. Good luck! 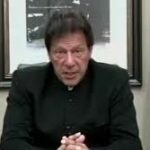 A brilliant article by you sir. My respect for the indian armed forces has greatly grown after reading your article. I’m still in my teens and wish to join the MARCOS when I grow up. Can you please provide me more details as to how I can join this elite team? My email address is amit.chandramouly@gmail.com . Beautiful and inspiring article by you sir. Reading the capabilities of the Indian Navy gives me pride and honour of being an Indian. Sir i’ll request if more HD images of the MARCOS shoeing their valour and killing instints can be posted to have an edge against any US and other defence system in the world. Lastly i will like to give my compliments for doing such great job. In India we have so many commando’s that the whole issue has become confusing. There is also a game of one up man ship and playing on the other’s turf. The Army has its Special Forces, the Air force has its Garud and the Navy has its MARCOS. The MARCOS should be trained basically to support Naval Operations or operations in Coastal areas where their expertise may be required. One fails to understand why they should be training in Counter Insurgency Operations which are land based operations and basically the forte of the Army. Similarly Garud should be confined to their sphere of operations with the Air Force, though one fails to understand what kind of special operations the Air force would be launching. At best they could be used for SAR for downed pilots. There need to be clear cut lines for operational deployments and training should be carried for specific requirements. Let’s not try to produce Rambo’s, that’s only for Hollywood to do so. Srihari you need to re read what I have written. Lets be practical, you cant have MARCOS fighting Bodo militants, or the NSCN and so forth. Perhaps you don’t understand the concept of employment and deployment of the special forces. You need to read more and get educated. The Army doesn’t have a complex about it and perhaps you wont understand the complexities of inter-service co operation which is quite shabby with each lobbying in the corridors of defence ministry. We are a laughing stock there and the babus love to play one against the other. Lastly you are unable to express yourself clearly and from your command over the language I am able to understand your that you do not have much of insight into these matters. The inception and employment of special forces is a serious matter and needs careful consideration. Till now most haven’t been tested in actual combat conditions – the state of affairs can only be gauged when you are tried and tested. The Armys Special Forces have been in it for long and have proved themselves. I am not here to rake up issues of inter service rivalry and one up man ship, I leave it to those that like to indulge in such like pursuits. I am talking about some practical and real time issues and aspects about special forces. Thank You. my dream is to serve my nation through my service by becoming a navy officer commando . Please send me a link if their is any seat or place for my service. in my email id. The MARCOS must be sent for peace keeping missions as the Garuda commandos are now on U. N. peace keeping missions. It seems apparent, that having combat effectiveness is a multi faceted vision, and perhaps our elite commando units can have a perspective on the matter. It did occur to me, when I was reading the section on the MARCOS, that this is an important consideration. I looked up the wikipedia on the Garuda Commandos and found that they were on U. N. peacekeeping missions in Somalia. 1st at least improve your english! Could you please post some more details about the MARCOS role in Kargil war ?